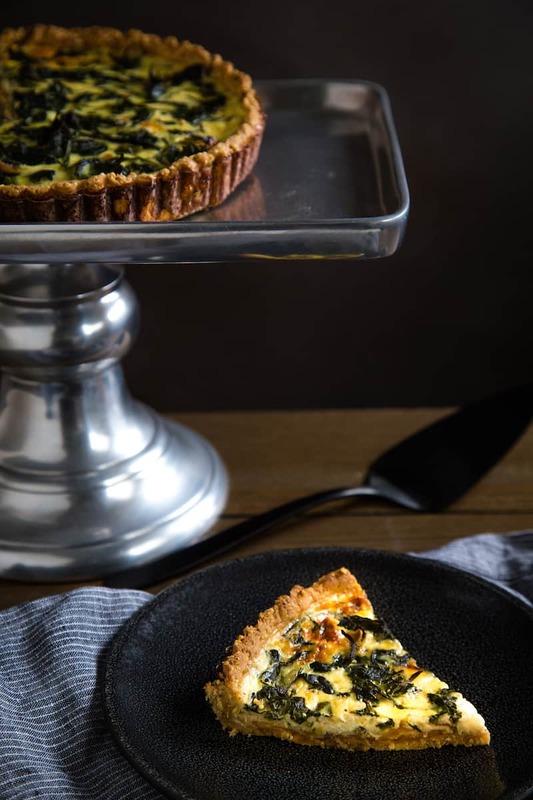 Caramelized Onion Tart with Spinach and Gruyere | Good. Food. Stories. Saturday morning cartoons have done a bang-up job brainwashing me. Listening to what Toucan Sam told me—that cereal was “part of a complete breakfast”—turned me into a cereal-eating monster, using it as my food crutch since I was tall enough to reach the milk in the refrigerator. I spent hours poring over the cereal wall in the college cafeteria. I frequently come home from Target with boxes of Marshmallow Treasures, Honeycomb, frosted wheat squares, and Chex galore. It may be a great late-night snack, but it’s no way to start my day. 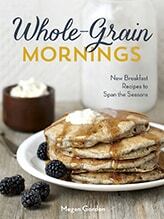 With Megan Gordon’s new cookbook, Whole-Grain Mornings: New Breakfast Recipes to Span the Seasons , I’m hoping to change that once and for all. 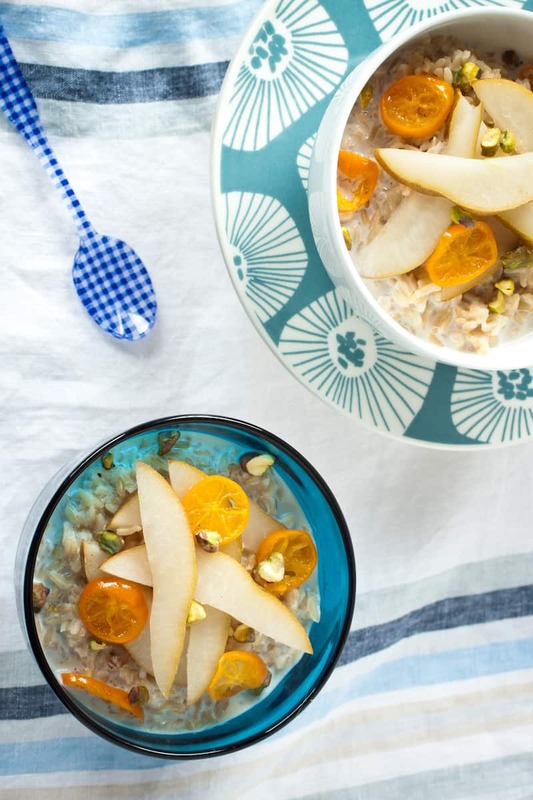 Whole-Grain Mornings is more than a collection of breakfast recipes. It’s a thoughtful and personal primer on changing your breakfast perspective. Reading through the recipes, I wanted to start my days sitting at a window-lined corner banquette of a cozy Craftsman bungalow, sipping coffee and spooning bites of strawberry oat crisp or a warm farro breakfast bowl. 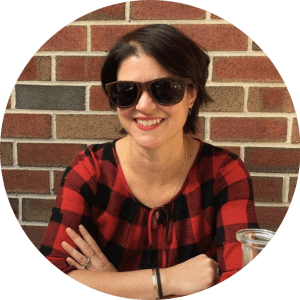 Megan, who also chronicles her kitchen life on A Sweet Spoonful, has a contemplative writing voice that immediately brings you into her world, and that quality comes through in spades throughout the book’s pages. If you know Megan from the creative granola she makes for her company Marge Granola, you won’t be disappointed. She generously shares recipes for signature Marge combinations like apricot pistachio and hazelnut cocoa nib granolas, and brings the sweet-savory balance of flavor that makes Marge granolas so irresistible to each dish in the book. Though the book is organized seasonally, it’s difficult not to want to skip between sections and find inspiration for your morning meals. The fall section’s creamy breakfast rice topped with honey-poached figs and pistachios was a powerfully nostalgic comfort, reminding me of a milky maple-and-rice dish my mom used to whip up in lieu of Cheerios. With fresh figs nowhere to be found in New Jersey supermarkets in January, pears and kumquats went into the poaching liquid instead. Megan fully encourages such substitution and experimentation throughout Whole-Grain Mornings, offering a “make it your own” suggestion at the end of many recipes. 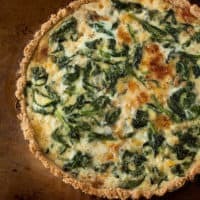 Similarly, the cornmeal-millet crust of a smoked salmon tart became the base of a deeply flavorful spinach and caramelized onion version. While it would do splendidly as a brunch dish, the tart made its way (and then disappeared all too quickly from) our lunch table without a peep of complaint. 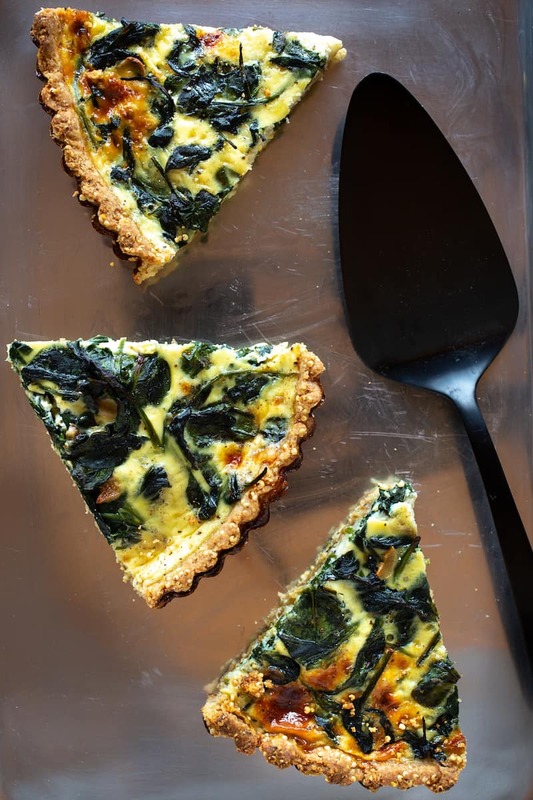 Toasty, crunchy, and simple to make in bulk, this tart crust will be a staple in my cooking repertoire for years to come. I’ll be trying it with ham and peas for Easter, peaches and blueberries in the summer, and certainly making the satisfying spinach tart that follows again and again. A quick browse through Whole-Grain Mornings is all it takes to inspire a new way of thinking about your breakfast routine. Whether you’re starting with a new buckwheat pancake recipe, trying your hand at homemade granola or yogurt, or remembering to make a little extra rice at dinner to top with a poached egg the next morning, I have no doubt the recipes in this book will make you a little more excited to get up in the morning. As a certain cartoon mascot would say, they’re magically delicious. 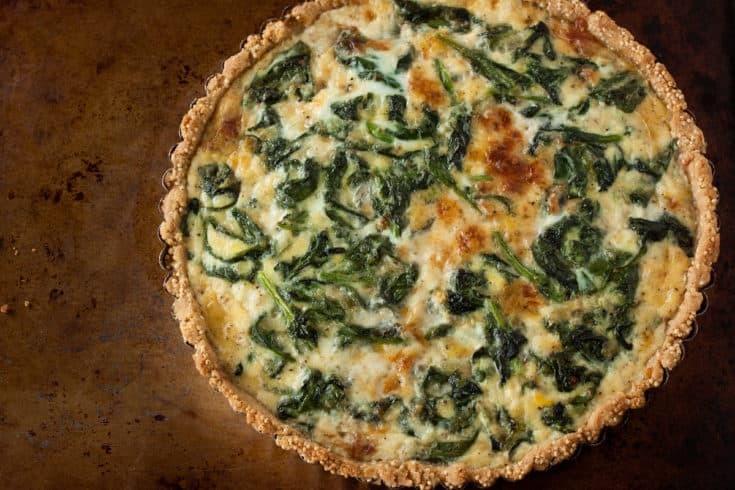 For brunch or lunch, try a caramelized onion tart with spinach, Gruyere, and a cornmeal-millet crust from the cookbook Whole-Grain Mornings. Spritz a 9-inch removable-bottomed tart pan with nonstick baking spray, or grease with oil or butter. Add the butter and pulse 8-10 times until the texture is pebbly with pea-size chunks of butter throughout. With the food processor running, drizzle 3 tablespoons water through the feed tube until the dough just starts to clump together. Add the final tablespoon of water if needed to make a cohesive but slightly crumbly dough. Turn the dough out into a large bowl and gently mix the millet into the dough with your hands. Press the dough evenly with your fingers into the prepared tart pan. While the crust chills in the refrigerator, caramelize the onions by melting the butter in a heavy-bottomed skillet over low heat. Add the onions and toss to coat, then cook, stirring frequently, for about an hour until the onions are deeply browned and soft. Scrape the onions into a small bowl and set aside. Add the garlic to the pan and stir to coat with the residual butter and onion scrapings. Add the spinach in handfuls and cook, stirring frequently, until the spinach is fully wilted and greatly reduced in volume. Scrape into a small bowl and set aside. Whisk the eggs, yogurt, milk, salt, pepper, and nutmeg together in a medium bowl. Place the chilled crust on a rimmed baking sheet (to catch any filling overflow). Cover with a piece of parchment paper and pie weights or dried beans, then bake for about 15 minutes, until the crust is slightly dry and toasty. Carefully remove the parchment paper and let the crust cool for about 10 minutes. Spread the caramelized onions in an even layer across the bottom of the crust. Sprinkle the Gruyere cheese in an even layer on top of the onions. Evenly drop the spinach in small handfuls on top of the Gruyere. Pour the egg-and-milk mixture into the tart crust. Bake for about 30 minutes, until the tart is golden brown and the filling is fully set and puffed. Transfer to a wire rack and cool for 15 minutes before removing the tart ring, slicing, and serving. The crust can be chilled up to 3 days in advance and pre-baked a day in advance of filling and finishing the tart. The onion and spinach can also be cooked up to 2 days in advance of assembly and baking. Refrigerate all elements and bring back to room temperature before assembling and baking with the egg custard.